Planning for, applying to and financing college is no easy task. Virginia Beach City Public Schools two military-connected school counselors, Amanda Yoder and Star Wiggins, saw a need to provide more information when they began working with military-dependent students years ago. They found many were waiting until much later than their peers to take the SAT or ACT and to begin college applications. “Since many of these students have a parent who went straight into the military after high school, they often need some additional assistance in the college application process,” said Yoder. 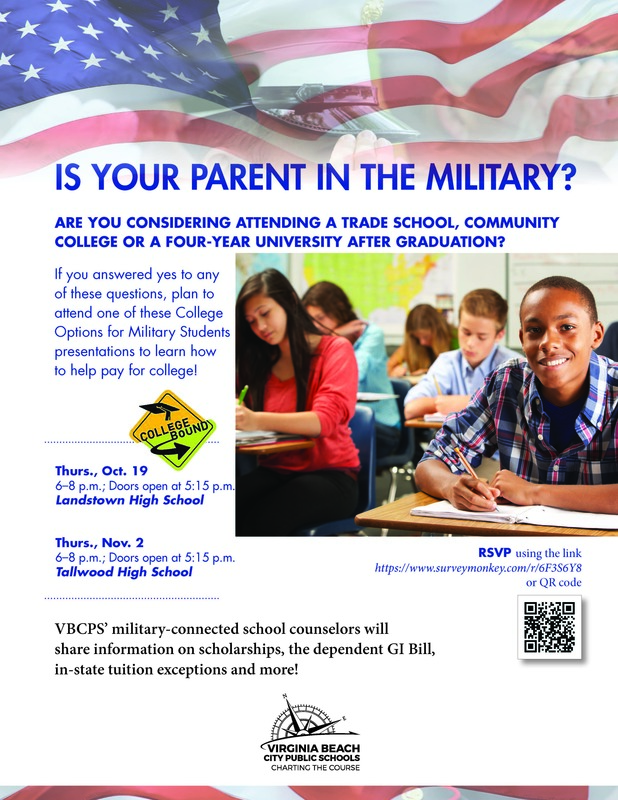 To further support VBCPS students and families with the process, Yoder and Wiggins developed a presentation entitled College Options for Military Students (COMS) and shared it at various high schools. As a result of the positive response to the information, Yoder and Wiggins now offer the presentation annually to citywide audiences. The next COMS presentations will be offered Thursday, Oct. 19, at Landstown High School and Thursday, Nov. 2, at Tallwood High School. Doors open at 5:15 p.m. for attendees to visit information tables about military scholarships and resources. The COMS presentation begins at 6 p.m. with time for questions and answers. The COMS workshop is free and open to all VBCPS students and families. Those interested in attending are asked to RSVP online. For more information, visit www.vbschools.com/military/ or contact the Office of Student Support Services at 757-263-1980.